Sixpence For Your Shoe: So many reasons to celebrate! 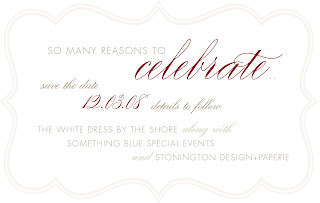 We couldn't have been more thrilled to be invited to spend a holiday evening together with the fabulous ladies of The White Dress by the Shore, Something Blue Special Events, and Stonington Paperie. The evening started with a fashion show featuring the fabulous frocks of Callie Tein at Modern Trousseau. Each gown she designs is more spectacular than the next. Following the show, we gathered for champagne and delicous delights by Gourmet Galley who are always spectacular. It was so nice to see Anna as we chatted together about a beautiful tented wedding we are planning together for the spring. In the Chic by the Shore studio space, dessert called our names. A winter twist on the take home buffet bar sat perfectly on the bay window with coconut puffs, white chocolate covered pretzels, vanilla frosted butter cookies and many other sweets! Elizabeth Hodes provided dessert cake tastings and shared samples of her stunning works of sugar paste art. It was so nice to see so many vendors we have worked with this year. As the holiday's near it is always a pleasure to take a step back and enjoy an evening of celebration. Thank you so much for inviting us Beth!